Rich, creamy decadent New York Style cheesecake made easily in your Instant pot! A small cheesecake perfect for a family night treat, a small dinner party or a romantic dessert for two. Instant Pot 6 inch New York Style Cheesecake with a few drips of pure maple syrup. Yum! My hubby and I ADORE cheesecake. 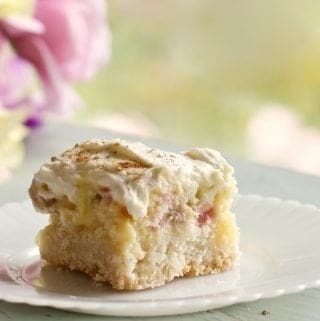 The dessert section of this blog has many gorgeous cheesecakes due to our indulgences in this creamy, delectable dessert. The Instant Pot is a great way to make a small one just the perfect size for Dave and I. The big surprise is how good Instant pot cheesecake is! Cheesecake is a good option for a make ahead dessert. Remember, all cheesecakes need time to set up properly. My family is guilty of eating cheescake still warm from the oven in cups with spoons because we simply could not wait. But really, the best cheesecake texture and flavor are achieved by a night in the fridge before serving time. 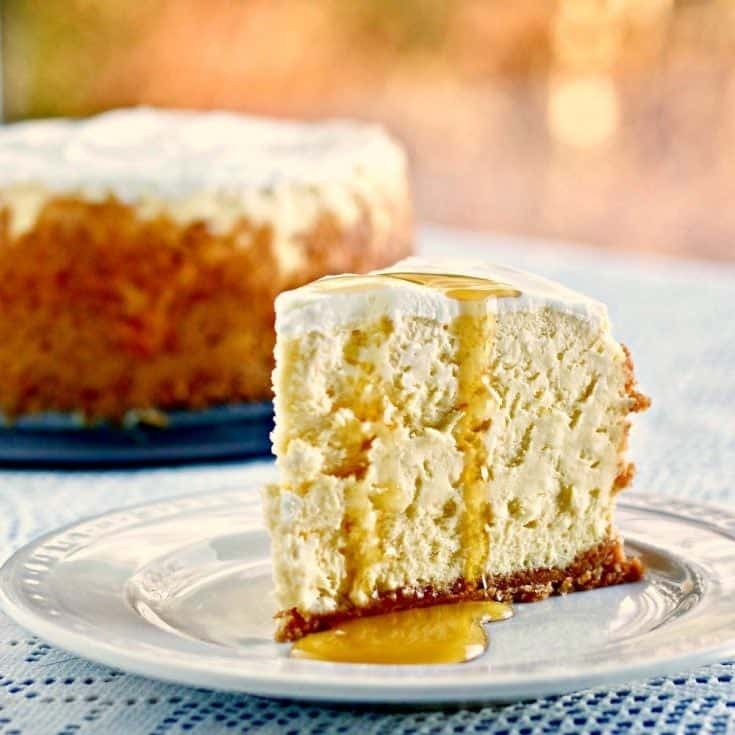 Check out all our cheesecakes recipes here. A delightfully rich and creamy cheesecake. I admit to hesitancy when I first discovered cheesecake could be made in an instant pot. My first thought was ” Should it be made that way?” I didn’t want to wreck a good cheesecake dessert. I researched and discovered the instant pot is a great way to cook a cheesecake. In much less time! The reliable oven method of cheesecake baking requires a water bath to perfectly bake cheesecake evenly without cracking. 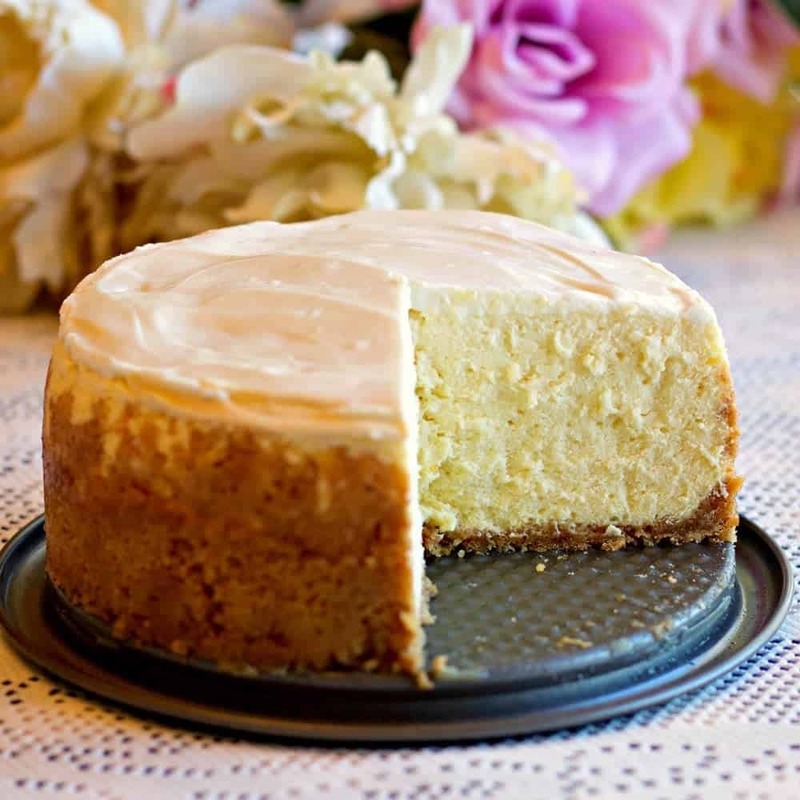 An instant Pot is actually steaming the cheesecake under pressure which develops a creamy dense texture and steams it to perfection without the cracking. I didn’t have to bake the crust by itself either. Just press in the crust, pour in the filling and set it in the Instant pot! I have made several cheesecakes in my instant pot. I made the first one a Crustless cheesecake just to see if I could. It worked just great! Same directions just omit the crust. Talk about easy! I have made a Gluten free crustless cheesecake in my oven for years as a way to easily lighten the calories. Now I can make this crustless cheesecake (not gluten free) more quickly. This Instant Pot version is an easy recipe perfect for your instant pot with or without the crust. Instant Pot 6 inch New York Style Cheesecake is the perfect size for a small but decadent dessert. 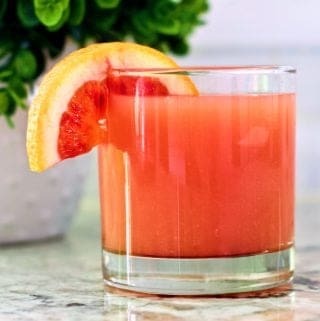 Update: I have had my [easyazon_link identifier=”B00FLYWNYQ” locale=”US” tag=”homefoodjunk-20″]instant pot[/easyazon_link] almost a year now and have made countless recipes in it with great success. If you are new to the IP keep learning this amazing machine. So Much to do with it! This 6 inch New York cheesecake recipe is a reliable, easy recipe our family LOVES. We also recently made a 7 inch White Chocolate Raspberry Swirl Cheesecake that is ‘To DIE FOR’ in our 6 quart instant pot. Yes, you can fit this [easyazon_link identifier=”B0012Q32JM” locale=”US” tag=”homefoodjunk-20″]7 inch cheesecake pan[/easyazon_link] into a 6 quart IP. Kayti just got her first IP. An 8 quart. More cheesecake recipes coming! FYI: ALL my daughters have Instant Pots now. Either this [easyazon_link identifier=”B01NBKTPTS” locale=”US” tag=”homefoodjunk-20″]instant pot[/easyazon_link] or the [easyazon_link identifier=”B01B1VC13K” locale=”US” tag=”homefoodjunk-20″]8 quart DUO[/easyazon_link]and they adore them. Great lil kitchen machines! As with any cheesecake you need to use ROOM TEMPERATURE ingredients for best, smoothest texture. So set out the eggs and cream cheese ahead of time. Do NOT overmix the eggs!!! Egg proteins are delicate and must not be overmixed or the texture of your instant pot cheesecake will get clumpy. For best texture and creaminess add the eggs at the end and mix on low speed until just combined. Cool the finished cheesecake and chill overnight for best flavor. It just keeps getting better and better! Large crumble the graham crackers (about 4 sheets) into the food processor bowl using the metal blade. Pulse until medium fine crumble and then add the sugar. Pulse until fine crumbs. Add the butter Pulse until the butter is mixed in. Pour the crumbs into your GREASED springform pan and press them evenly into the bottom and partly up the sides. For the Filling: Rinse out the food bowl and dry it. Pulse the cream cheese until it’s smooth then add in the other ingredients EXCEPT EGGS and pulse until mixed. Now add the eggs one at a time and pulse ONLY once or twice each, until mixed. Use a spatula to pull the cream cheese off the sidewalls of your food processor or bottom as needed. Pulse once or twice to combine the lumps into the batter. This will give you a creamy dense texture. Pour the batter into the springform pan and cook as directed. Add the crushed crackers and sugar to a mixing bowl. Melt butter and add to graham cracker mixture. Stir until just combined. Press crust mixture into bottom of greased 6-inch cheesecake pan and partially up the pan sides. Set aside. Blend together cream cheese, sugar, cream, flour and vanilla extract until smooth. Add eggs one at a time, lightly mixing until just combined. Add 1.5 cups of water to the bottom of your pressure cooker and then place the instant pot trivet (comes with your machine) with handles up inside the pot. Place cheesecake into pressure cooker onto the trivet and in between the handles. Press the manual button. Set to High Pressure for 37 minutes. Allow an 18 minute natural release. After all pressure has been released, open pressure cooker and carefully lift the pan by the trivet handles making sure it is evenly balanced. (I suggest you use silicone mitts for this) Tilt the cheesecake pan and dab off any liquid that may have accumulated. YOU MAY ALSO place tinfoil over the cheesecake before cooking to prevent moisture from absorbing into the crust. The tinfoil can be tricky to work with. But it will keep the moisture off the cheesecake. If you are out of sour cream, as I was, you can substitute greek yogurt. Whisk together the Greek Yogurt (or sour cream) and sugar and then spread on the hot cheesecake. Let the topped cheesecake cool on the instant pot wire trivet. Cool on your countertop until it’s easy to handle (about an hour). Set in your fridge in the springform pan until set. This will take several hours to overnight. Remove the springform pan sides and serve on the bottom plate. Garnish with a few drips of pure maple syrup or any topping you prefer. This cheesecake tastes wonderful all by itself too. Pour the crushed crackers and sugar into a mixing bowl. Pour crust mixture into bottom of greased 6-inch cheesecake pan and press the crust mixture firmly into the bottom of the pan. Press the crust part way up the pan side. Add 1.5 cups of water to the bottom of your pressure cooker and then place the instant pot trivet with handles inside the pot. Place cheesecake into pressure cooker onto the trivet. Open the vent Open the pressure cooker and carefully lift the pan by the trivet handles making sure it is evenly balanced. Gently absorb any liquid on the cheesecake with a paper towel. Whisk together the Greek yogurt and sugar (Or sour cream and sugar) and then spread on the hot cheesecake. Let cool on wire rack until cool enough to easily handle. Cool on your countertop until it's easy to handle. Set in your fridge in the springform pan until set. This will take several hours to overnight. Garnish with a few drops of pure maple syrup or any topping you prefer. If you have a food processor use it for the best texture! Cream the cream cheese until it's smooth then add in the other ingredients EXCEPT EGGS. And pulse until mixed. Now add the eggs one at a time and pulse ONLY until mixed. Use a spatula to pull the cream cheese off the sidewalls of your food processor or bottom as needed. The total time to complete this recipe depends on how long it takes to get your instant pot to pressure up. (about 10 minutes in my 6 quart duo). And also how long you choose to chill the cheesecake after baking.An overnight chill time is recommended. I just made this Instant Pot White Chocolate Raspberry Swirl Cheesecake. It’s to die for!! Looking for more cheesecake Inspiration? Here you go. This recipe is featured in the 25+Sweet Instant Pot Recipe collection and The 25 Best Recipes to try in an Instant Pot Round Up. Look there for more great instant pot dessert ideas! Recipe slightly adapted from This Old Gal.Her site is FULL of great helps for making cheesecake in your instant pot. WOW, made it waited 20 hrs, finally tried it, outstanding. Thank you! I did everything you said except I wrapped pan totally with aluminum foil leaving the top tented, cooked 40min, left in pot 25 min. There was not moisture on top and no cracks. The Cheesecake Factory can’t do any better. Again Thank you. Thank you for bringing up your concerns. I will update the recipe with the tip about the tinfoil tent. A few people have had problems with the crust absorbing moisture while cooking in the instant pot. The tinfoil tent will definitely help with that. However the tinfoil can make it a bit tricky to get the cheesecake out after cooking. And that instruction is also in the recipe card. Add 1.5 cups of water to the bottom of your pressure cooker and then place the instant pot trivet with handles inside the pot. Can’t wait to hear how your recipe turns out for you! Have a great day! I have an 8 quart Instant Pot. If I made the original recipe in the 6 inch pan, would the cook time remain the same? I also saw where someone used an 8 inch pan and 1 1/2 or doubled the recipe for the 8 quart Instant Pot. Any idea what the cook time would be for that? I’m dying to try this recipe!!! Hi Donna, Your 8 quart should work great for the original recipe as written. For doubling the recipe and using an 8 inch pan try cooking it for 40 minutes and natural releasing the pot. Also use a foil tent to keep the moisture off the cheesecake and crust. Best of luck. Please let us know how this works for you. It helps our other readers and we appreciate the feedback. Have a great day and best of luck! A 6” pan fits nicely in the mini ultra, so should I use a lesser amount of Water? I would use enough water to go up the the bottom of your pot trivet. I’m glad you can fit a 6 inch in there. Be sure to keep the arms up on your trivet or use a tinfoil sling so you can retrieve your pan after the pressure is released. best of luck. Can’t wait to hear how this works in your mini. I do know one other reader did make this cheesecake in her 3 quart. So I’m sure it will work fine. Best of luck! Lastly, put a loose foil tent over the top of your pan to prevent the water condensing on your cake. If it does you can blot the water up. Your crust may get a bit wet though. Adam you can turn off the instant pot or leave it on or put it on warm after cooking. The pot will retain its heat until the pressure is off pretty much. I often take the cord off mine while natural releasing cheesecakes. Can’t wait for your report. BUT after baking it needs to go in the fridge and chill as directed before you will really know how well it turned out. So maybe tomorrow? Best of luck! Hello! I am super excited to make this recipe. Although, I bought all the ingredients for a 6-inch pan and I only have an 8 inch. Will it still turn out if I use all the ingredients but in an 8 inch? I’m thinking that it’ll just be thinner. Should I change the time in the instant pot? Thank you!! Hu Alex, This is risky. Your crust will be very thin (Unless you add about 1/3 more ingredients for it) and the cheesecake will indeed be very thin. If you want to give it a try, reduce the cooking time by about 5 minutes. Best of luck and Let us know how it turns out! Thank you for getting back to me so quickly. I went ahead and doubled the crust recipe since I had enough ingredients to do so. I did, however, use the 6″ pan recipe in my 8″ pan. It turned out fantastic and was enjoyed by my family. Although, my crust got somewhat soggy on the top. I went ahead and trimmed that bit off and it was great. How could I avoid that in the future? Also, my cake was thinner and not as thick as traditional cheesecake but still tasted and cooked the same. I cooked it for 33 minutes and did a natural release for about 13 minutes. Thanks again, I look forward to doing some more of your recipes. Oh that’s great news! To avoid a soggy crust top try making foil tent loosely over the cheesecake before cooking it. I’m so happy you let me know how it went and that your family enjoyed this desert. If you’re looking for a larger cheesecake for your bigger pan try this one! Instant Pot White Chocolate Raspberry Swirl Cheesecake | Homemade Food Junkie – Homemade Food Junkie | Passionate about making healthier recipes from scratch, mostly organically! 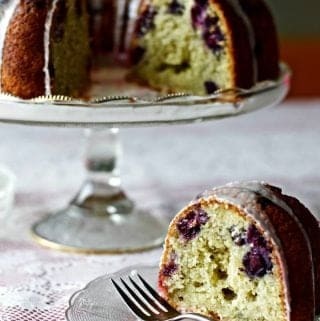 Can i use the instant pot spring loaded glass bottom cake pan for this recipe? I just commented on my instant pot in regards to using the cake pan i purchased on instantpot.com. it has a glass bottom i believe. Is it ok to use that?? Yes. The glass bottom will be fine. If you purchased it off the instant pot website it is designed for that pot. I have the 8qt duo. Still learning it. I really want to try this cheese cake recipe. But o ordered the instant pot 6 or 8 qt spring loaded cake pan. I purchased it at instant pot website. Is it ok to use it for this recipe?? Hi Adam, Congrats on your new instant pot! Any 6 inch springform pan will work for this recipe. Our white chocolate raspberry swirl cheesecake will be a better recipe if you have a seven inch diameter springform cake pan. White Chocolate cheesecake. Best of luck and please let us know how it goes for you! Best of luck Adam, Can’t wait to hear how it goes! My mini duo does not have a manual button just pressure cook. Is it the same thing. Just made the cheesecake! Yep! It’s awesome!! So light, fluffy and delicious!! Excellent recipe and instructions. Thank you!! Hi Laura, I’m so pleased!!! Thank you for coming by to share your results for others. Happy New Year! Hello! 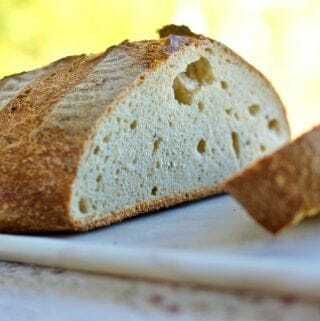 Could I use almond flour or omit the flour? I need gluten free and this looks awesome! Planning on making it crust less. Thanks!! Hi Terry, I believe you can just substitute the all purpose flour 1:1 with almond flour. The cheesecake might be a bit different than what you see in the pictures here. You could also try adding an egg and omitting the flour altogether. If you do that and the batter seems too loose add the almond flour in at the end. Good luck! We would LOVE to know how this turn out. Happy New Year! NOTE: We DO have a crustless New York Cheesecake that is gluten free. It is a Nine inch cheesecake made in the oven. It is delicious! Thanks so much! I may look at the gluten free recipe, but I have my heart set on using the instapot! I think I’ll try the extra egg and see how that works. I’ll come back and let you know how it turns out. Wish me luck! Break an egg Terri! 🙂 We can’t wait to find out your results. pan that just fits into the 6 quart IP. Will this work? If so what do you recommend for a cook time? Hi Barbara, If the pan fits tightly I would recommend you put it in a foil sling so you can easily remove it from the instant pot. Make a foil sling by taking a piece of foil long enough to lay on the instant pot trivet and go under the pan, up it’s sides and lay over on the top so you can reach it when the cheesecake is done. Fold the tinfoil in thirds the long way (or half) to strengthen it. Now you just pull up the tails and the pan will slide up the pot. For and 8 inch pan double the recipe and cook for 40 minutes. I would love to know how this turns out for you. Thanks for the question. Have a great day! It worked fine, the pan was a pretty tight fit so I think I will invest in a 6 inch pan and try the recipe again. I think the texture was a bit different than what I expected so maybe it needs that extra space around the pan to get the New York consistency. Taste was good though! Hi Barb, Thank You for sharing your experience with us and rating this recipe. I believe you will have the best luck with a 6 inch cheesecake pan for this recipe. And for your best results let it chill overnight. All the best! I would love to try this- a co- worker has made it and says it came out perfect. Is it possible to make a cheesecake in a 3 Qt Instant Pot if I have a small enough springform pan? You can use a 3 quart instant pot for this recipe. Just find the pan you want to use and follow the directions I’ve included below. I’ve never made singles in the instant pot or the smaller pans but these bloggers have shared their experience with doing that. I’m glad your co worker enjoyed this recipe. Please let us know how it turn out for you! “If using the mini 4 inch pans, divide into three mini pans and cook for 12 minutes, with an 18 minute Natural Pressure Release. If using 5 inch pans, cook for 17 minutes, with an 18 minute Natural Pressure Release. Aneesha over at GMK makes hers this way. This cheesecake was so good. My husband and I loved it. We topped it with raspberries. Quick question though, my crust at the top was a little soggy. I tried to get some of the water up with a paper towel, but there was actually quite a bit. I cooked it in a 7 inch spring form pan and had it on high pressure for 32 minutes (saw that you said to do that in another comment). Any ideas for next time? Hi Ann E, I’m delighted that you loved this cheesecake! Next time carefully lay a tin foil tent over the cheesecake pan once it’s in the instant pot very loosely. Dome the tinfoil at the top so the water runs off to the side. Doming the tinfoil make it easy to grab it off the cheesecake when it’s done too. Thanks for sharing your experience and rating this recipe for us. Happy Easter to you and your family! Can I use parchment paper for the lining? Hi Cindy, Parchment paper should work great on the bottom of the pan. I would not line the sides of the pan. Just oil the pan sides. Is the Instant Pot the same as a pressure cooker? I have an electric one and use it often but never thought to use it for cheesecake or popcorn. Hi Barbara,The Instant pot is an electric pressure cooker. Instant Pot is the brand name of the one I use. I am AMAZED at how wonderfully it makes cheesecakes. Let me know if you try this recipe in yours. I’d love to know how it works for you. Happy Holidays! I do not have a springform pan and want to use the pot the machine gave me when I bought it. I am not a baker…what do you think about putting parchment paper in the pot so I can pull it out of the pan?? Guess I am going to try it! Hi Jill, I STRONGLY warn you against doing that. The instant pot REQUIRES water under the cheesecake to build pressure and cook the cheesecake. TRY THIS INSTEAD: You can do a pot inside the insert that fits and will sit on top of the instant pot trivet with your water under the trivet. Then put the pot in a tinfoil sling. Then the cheesecake will cook. You just need to find a pot that will hold the cheesecake batter. Then your biggest issue will probably be be getting the cheesecake out of the pan. Lining it with parchment paper is the best way to do that.Good luck! Please let me know how this goes for you. I just got the 8 quart ip, mine didn’t come with a trivet. It came with a steamer tray thing with handles, is that what you are referring too? Hi Jennifer, Congrats on your new instant pot! The steamer tray is what I am talking about, yes. I just bought the 8 quart for my daughter and we were looking at the set up yesterday. I tried out a cheesecake pan in it. The tray handles should lift it out just fine. Have fun with your new kitchen BFF. All my daughters and I love them and instant pots make divine cheesecake. Enjoy! I have just gotten my instant pot and have made 2 things in it so far. I love it. 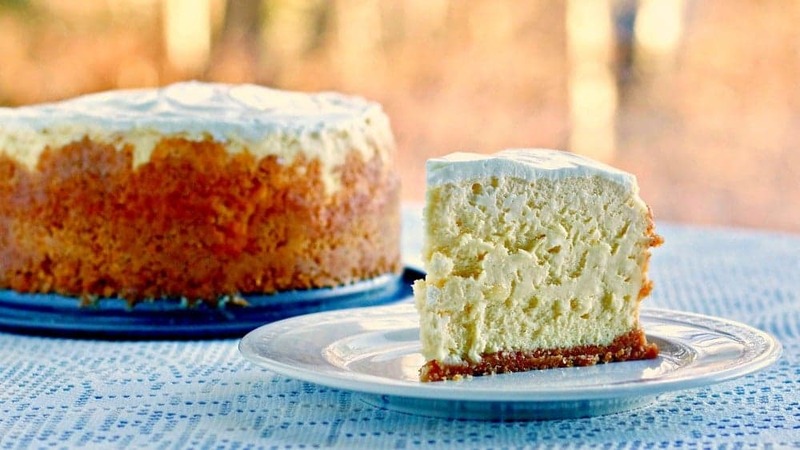 I want to make cheesecake, and THAT I have never made before, even in the oven. My question will sound really dumb, so sorry for my ignorance, but you say to put the cheesecake in a pan first, then to put it in the IP. Does that mean you put the pan in the IP? AND that includes the bottom? Not just the sides????? I am confused, as I truly don’t bake… hahaha, but have something I want to make this for and have this new pot and am excited to try it! You will need to pour the batter into your springform pan with the bottom and sides of the pan attached. Otherwise your cheesecake will run all over the instant pot insert and mix up with the water in the instant pot insert. Please NOTE: DO put the springform pan on a trivet over the water in your insert. The trivet that come with your instant opt has handles on it. Keep the handles up around your springform pan. This will make it MUCH easier to remove your finished cheesecake from the instant pot. This is a REALLY easy method of making cheesecake. I’m sure you will have no trouble after you give it a try. I’d love to know how it goes for you. Thank you for your questions and I hope this helps! Hi Cathy, That’s how I would do it. No need to let the caramel harden up before you cut the cheesecake into pieces. Pour on the caramel sauce just before serving to make it easy. Plus I believe it would be easier to eat if the caramel sauce is fluid, not hard. I’d love to know how it goes for you. Thanks for the question! Do you cover your pan with foil before putting it into the insta pot? Thank you! No we don’t use foil at all in the Instant pot for this recipe. We have never had a pan leak and the crusts are perfect. The cheesecake top is almost dry when done. If you get a few drops of water on the top blot them off with a paper towel. Thanks for your questions! I only have a 9 inch spring form pan. Would that be a 22 minute cook time? Hi Lisa, Unfortunately, If you want to make cheesecake in a nine inch springform pan the instant pot will not work. It will not fit into the instant pot. To my knowledge nothing bigger than a 7 inch cheesecake pan can be used in an instant pot. I do have several lovely cheesecake recipes for the oven if you like. Otherwise you will need to purchase either a 6 or 7 inch springform or push up cheesecake pan (I have some affiliate links for you in this post)for your instant pot. Be sure to measure your pot insert before you buy and make sure it fits your pot. I hope that helps you. Have a great day! Hi Nancy, THANK YOU! I happen to be visiting my daughter and her 8 quart instant pot. 🙂 I’ll be using your instructions soon! I am making this cheesecake today. Your recipe looks awesome. Quick question: another blogger mentioned making two at a time, stacking one somehow on top if another in the Instant Pot.. Do you know anything about this and how to do it? Would love to make a couple at a time. Hi Bill, I have actually made two cheesecakes at a time with my ekovana pots. You will have to take a look at my Instant Pot White Chocolate Raspberry Swirl Recipe to see my discussion on two pot cheesecake baking. It was a success. I highly recommend it. If you don’t want to use the ekovana pots you may be able to use two 6 inch cheesecake pans with a trivet over one. I have not tried the trivet method. Good luck! I’d love to know how the cheesecake turn out and what you learned about two pot cheesecake baking. Thanks so much for the question! Made this last night in my Instant Pot. Had it tonight and it was fantastic! I drizzled a little boysenberry syrup on top of each slice. It was decadent. Husband loved it. And I was surprised there was almost no water on top as I had expected there would be. Thank you for the recipe – it is my new way to make my cheesecake! Hi Nancy, Thank you so much for reviewing this recipe for us. I’m delighted you love it as we do. The boysenberry syrup topping sounds Delicious! I may never oven bake another cheesecake either. I love instant pot cheesecake! Have a wonderful day! Finally a commenter from someone who’s actually made the recipe! Thank you for your comment; it’s the only one so far that is helpful to those of us who are trying to decide whether to try it ourselves or not. Never mind I see it. Thanks. I have a 7″ springform pan. I haven’t made cheesecake in the Instant Pot but I’d like to. I read your crustless gluten-free one, which appeals to me. Can I just make this recipe and leave out the crust and the four? And do I have to put sour cream or Greek yogurt on top? Can’t I just leave it the way it is? I gather you don’t have to put foil around the pan the way you do usually before you put it in the water bath ’cause putting it on the trivet in the Instant Pot means it won’t get wet – right? Do I cover it with foil? Thanks… I’m going to check out your other IP recipes too. If you want a recipe that is gluten free and crustless try my Crustless New York Cheesecake. It does NOT have the sour cream topping either. I have NOT made that recipe in an instant pot but it should work and looks like what you really need. For a seven inch pan This recipe should fit. Put 1 1/2 cups of water in the instant pot, place the springform pan on the trivet (If it fits. If not use a tinfoil sling) and Cook it on manual for 44 minutes. As to the water:You can choose to cover the springform pan with tinfoil, if you like. I haven’t had any problems with water in the cheesecake. It’s easy enough to soak up any water with a paper towel if necessary. Good luck! I’d love to know what you do and how it turns out. Hello. I have an instapot and this recipe sounds good. What type of springform pan did you use. I have a Pampered Chef one with the glass bottom and I would be afraid to put that in the pressure cooker. I also have an all-metal one too. This pressure cooking is all new to me. Thanks for any suggestions. I will up date my post and put my pan in. I found mine in a local kitchen shop. I have heard really great things about the Daddio 7 inch pan. I ordered it but they sent me something else. I would love to know how your cheesecake turns out! Have a great day. There is a beautiful Spring form pan that has silicone sides. Would love to know it worth the buy. I would use for Cheese cake and breakfast or supper frittata. Well as to that I don’t know. I can’t find one that will fit an instant pot. I did find the 9 inch Norpro with a glass bottom and it is well reviewed. I’d love to know how it works for you if you use one. The best thing about them is the cheesecake will not stick to the silicone sides. However you will need to oil the glass bottom. Also one reviewer did say picking this cheesecake pan up full of batter or freshly baked out of the oven the sides can cave a bit and ruin the perfect circle shape. So keep that in mind. The water bath pan may be tricky to retrieve it from. Best of luck!